One of my favorite treatments to perform at my plastic surgery practice is the facelift, because the results can be so gratifying to my Thousand Oaks patients. Unfortunately, the media has often misconstrued the procedure to yield “frozen” results, portraying as the norm examples of skin pulled back so tightly that the patients look unnatural. Luckily, these cases are not common and can be avoided. Instead of “frozen,” results should appear natural, refreshed, renewed — and still subtle. You can see what I mean in the before-and-after photos above. There are a few things you can do to pursue similar results. Checking for board certification is perhaps the most important thing you can do when searching for a surgeon. This certification should come directly from the American Board of Plastic Surgery (ABPS). The ABPS sets the highest standards of training, results, safety, and continued education for their members. You can be sure that a board-certified surgeon has been extensively trained and informed on the latest technological advancements and surgical techniques available. In addition to searching through ABPS, you will also find that many surgeons display their board certification prominently on the their websites or mention it on their Curriculum Vitae. It is critical that you discuss your concerns and the goals of your surgery extensively with your surgeon. Consult photos from their before-and-after gallery for cases you admire, consider aspects of a friend’s or celebrity’s face that you would like to achieve, and explain these in-depth to your surgeon. This will lead to a shared understanding of the results you want, and your surgeon can take the opportunity to explain what’s possible for you. Each patient’s facial structure and aesthetic goals are unique, and so the results should be equally unique. However, for every patient, my goal is to create a subtle, renewed look. I hope their friends and colleagues notice — not that their appearance has changed drastically, but only that the patient looks more vibrant and refreshed. The pre- and post-surgical information provided by your surgeon is non-negotiable. Breaking these guidelines may be detrimental to your surgery and healing processes. For example, your surgeon will likely require you to refrain from smoking during the months before or following your surgery. Smoking will significantly extend the time required for your body to heal, as the chemicals in the tobacco interfere with the body’s ability to repair itself from the incisions and surgical processes. Additionally, failing to wear sunscreen after surgery — both on and around the locations where the incisions were placed — will cause the scars to worsen and become discolored. Even the smallest details like these will affect your results. In the past, traditional facelift procedures simply lifted and tightened the skin around the face, without addressing the underlying muscle. 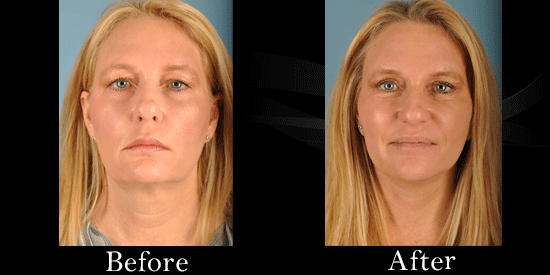 This method provided only temporary results, and patients soon saw their facial features return to their pre-surgery form. Today, our advanced techniques address the SMAS, or superficial muscular aponeurotic system, which lies below the skin and upper layers of tissue. 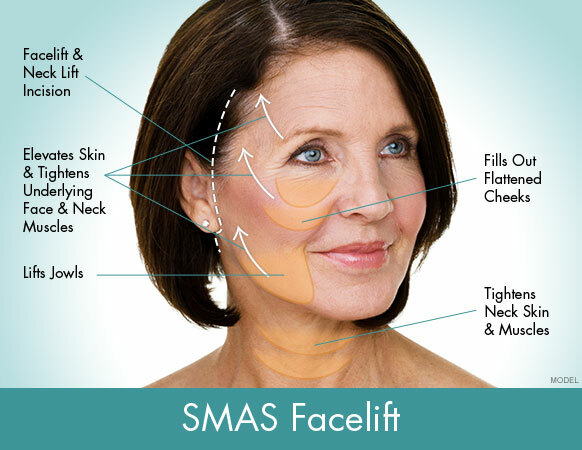 You can see how the facelift procedure approaches each of the treatable areas in the image below, addressing different SMAS muscle groups. While your facelift results will be exciting and transformative, you can help to maintain the appearance of these results with the proper skin care regimen. This may include medical grade skin care products, such as SkinCeuticals® and ZO® Skin Health products (both offered at my practice). These will help prevent signs of aging, hyperpigmentation, discoloration, and maintain even skin texture and tone. Laser treatments can also help to restore skin’s appearance and boost the production of collagen for wonderful, glowing skin. You may also opt to complement a facelift with dermal fillers such as JUVÉDERM®, which can help restore the lost volume in areas like the cheeks and lips, further enhancing your face for a more youthful appearance. To delay the appearance and formation of future wrinkles and fine lines such as crow’s feet, “angry 11s” between the eyebrows, and smile lines, you may also consider BOTOX® Cosmetic. Each of these treatments can work together in your anti-aging routine. To learn more about the facelift procedure, I invite you to read an article I wrote in Westlake Malibu Lifestyle magazine, where I debunk 5 myths common facelift myths I’ve heard from patients. You may be surprised at a few of the facts!